Holy Balls! What a Sale! Amazing… three days of Free Balls, and over 20,000 new Ballers playing the game! Thanks everyone for an unbelievable sale – it was a pleasure watching the game climb the charts and seeing everyone’s high scores go wild. We can’t believe some of the scores the new players are getting. Keep at it! You’ve inspired us to make a Lite version… more on this soon. Ow My Balls 1.4 is LIVE – FREEBALLIN’ WEEKEND! Woohoo! The 1.4 update has just been approved and is now live in the App Store. We really hope this addresses most or all of the gameplay concerns and issues in the 1.3 release. Please let us know what you think – we’re anxious to hear everyone’s feedback! To celebrate, we are making OW MY BALLS FREE for this weekend only! That’s right, My Balls, both of them, are FREE this weekend! So tell your friends, your mom, your kids, that they can get this hilarious game and still have 99 cents left to get a Coke. Great news – we just submitted the 1.4 update for review! We have added four gameplay modes to ensure the game is fun for everyone. The gameplay style from 1.3 is now called “hard mode” which is a pretty good description of it. We’ve added “easy mode”, which is easier than the game has ever been, and medium which is closest to the gameplay style from 1.2. 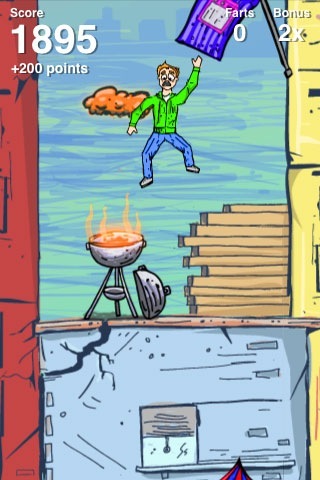 We’ve also brought back unlimited farts as “freestyle mode” which can be unlocked by scoring 250,000 points. Hopefully this new update of My Balls will be in your hands within 2 weeks. Fingers crossed. Holy balls! We got a lot of feedback about the 1.3 update and are rushing out a 1.4 update this weekend to address it. Clearly the game is now way too hard and we’ve got to do something about it. We really wanted to make the gameplay challenging, but looks like we went overboard. We were experimenting with different gameplay modes before the release but decided to hold off till the next update. We’re going to crank 1.4 out, along with unlimited farts, as fast as we can. Thanks for the feedback – we really appreciate it! This update is the result of a heroic multi-month effort to completely redesign the game and take it to the next level. We’ve always been convinced that this game is a sleeper hit, but we also knew it needed some real improvement to get there. Almost 90% of the code was re-written for this update to ensure a high performance crash-free experience. Endless gameplay – there is no limit to how long you can play! We put a ton of work into this update, more than the original game itself, so we really hope you all like it. Thanks for hanging in there. Ow My Balls! XL and Ow My Balls! 2.1 on Thursday! Ow My Balls! 2.0 is OUT! and FREE! Copyright © 2019 Ow My Balls! The game – .